Following the relentlessly grim chore of a movie that was Batman v Superman: Dawn of Justice, it’s good to see that DC has developed a new sense of fun and mischief to their movies. Suicide Squad may not be as triumphant as Marvel counterparts The Avengers or Guardians of the Galaxy but it has a rambunctious and irreverent quality to it that appealed to me more than I expected that it would. 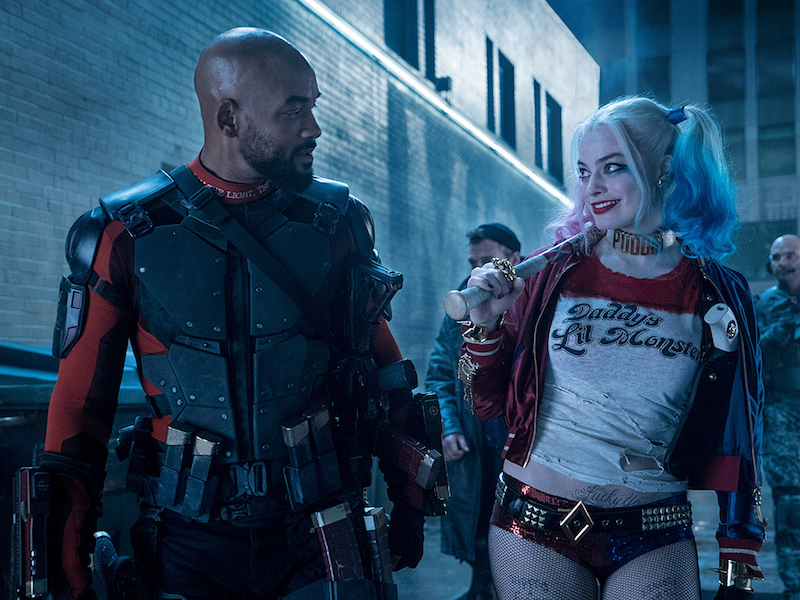 Director David Ayer has the daunting task of juggling a plethora of comic book characters, most of whom will be new faces to general audiences, and he succeeds in doing so while also drawing some memorable performances out of his sprawling cast. The film introduces ruthless government official Amanda Waller (Viola Davis) as she seeks to build a covert mercenary task force in order to combat pending otherworldly attacks after the events of Dawn of Justice. She recruits a band of dangerous criminals, including Harley Quinn (Margot Robbie), Deadshot (Will Smith) and Captain Boomerang (Jai Courtney), as disposable assets in case any of the missions are compromised and the public seeks a scapegoat on whom to cast the blame. When one of the Squad members defects and seeks to wipe out mankind’s technological resources, the remaining ragtag band of misfits pool their unique talents and abilities to bring down the emerging threat. Jared Leto also turns up in a subplot as a new iteration of the Joker and Ben Affleck briefly reprises his role as Batman but despite the standings of these characters in pop culture, their presence doesn’t overwhelm the film but instead situates the Squad members as the main focus of the narrative within this larger DC universe. While there may not be an even time split between the backstories of these new characters, we do get the lowdown on each of them from a flashy dossier montage early on that gives us enough context to how each of them may fit into this troubled team. There’s also a refreshing level of ambiguity to their roles on the moral spectrum of the comic book genre; they’re not quite heroes, villains or even anti-heroes. The primary winning element of this film is the commitment level to the performances, specifically from Smith and Robbie. The two previously starred in last year’s con caper Focus and even in this wildly different setting of crazy costumes and wall-to-wall action, they maintain an electric chemistry and quick-paced repartee that scores plenty of laughs (Smith, in particular, has some outstanding one-liners). On the dramatic side of things, Viola Davis brings a quiet intensity and fierce intelligence to her character that keeps her one step ahead of her crew and often makes her the most captivating character in the movie. No matter how things pan out box office-wise for Suicide Squad this weekend, it’s been made clear that this is meant to be a one-and-done feature and that going forward, DC will presumably put all of their eggs in the Justice League basket. As someone who enjoyed this movie, I can also appreciate the fact that we won’t have four unnecessary Suicide Squad sequels to bare if Warner Brothers hits its mark financially with this effort. As a scrappy and slight piece of offbeat superhero fare, this had just the right kind of crazy to keep me on board with the Squad.